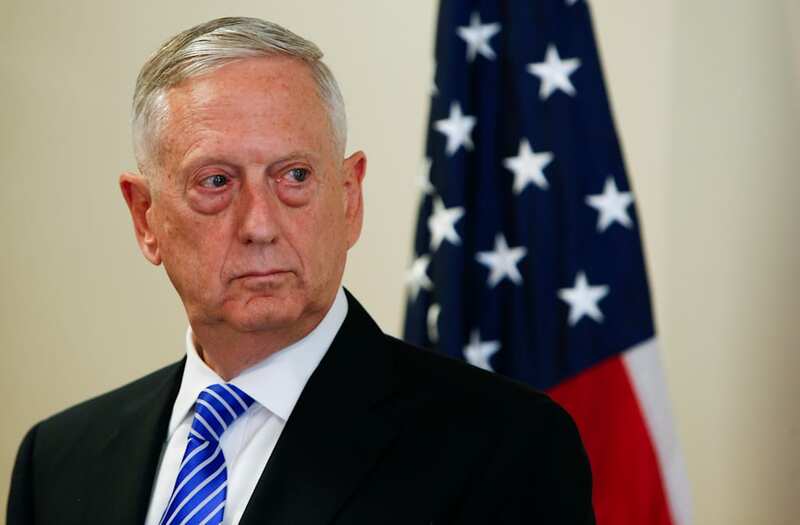 When President Donald Trump tweeted his reversal of the Obama-era decision to allow transgender people to openly serve in the military on Wednesday, his secretary of defense, Jim Mattis, was on vacation and appalled by the move, according to the New York Times. Mattis apparently only had one day's notice about the decision, which he had labored over for months while evaluating how to implement the Obama policy. Sources close to Mattis told the Times that he was "appalled" by Trump's rollout of the policy, which shocked many in the Pentagon and left active-duty transgender service people unsure of their fate. "We should all be guided by the principle that any American who wants to serve our country and is able to meet the standards should have the opportunity to do so — and should be treated as the patriots they are," McCain said. Democratic House Minority Leader Nancy Pelosi noted in a statement that the date of Trump's announcement coincided with the date President Harry Truman desegregated the military in 1948. "Sixty-nine years later, President Trump has chosen this day to unleash a vile and hateful agenda that will blindside thousands of patriotic Americans already serving with honor and bravery," Pelosi said. "This disgusting ban will weaken our military and the nation it defends." Republican Sen. Richard Shelby of Alabama was first told of Trump's announcement during a CNN interview, responding that he wanted to read the policy's wording but was sure the Senate will hold hearings on the matter. "You ought to treat everybody fairly and you ought to give everybody a chance to serve," he said. Democratic Sen. Tammy Duckworth of Illinois, an Iraq War veteran who lost her legs in combat, called the ban "discriminatory and counterproductive to our national security." "When my Black Hawk helicopter was shot down in Iraq, I didn't care if the American troops risking their lives to help save me were gay, straight, transgender or anything else. All that mattered was they didn't leave me behind," Duckworth said in a statement. "If you are willing to risk your life for our country and you can do the job, you should be able to serve — no matter your gender identity, sexual orientation, or race." When Republican Sen. Orrin Hatch of Utah was asked whether he stood with the state's transgender community, Hatch responded "Yes" on Twitter, then released a longer statement saying "I don't think we should be discriminating against anyone." Democratic Sen. Sherrod Brown said in a statement the military "should not turn away anyone who is willing and able to serve this country and help keep Americans safe." The ban is "discrimination, plain and simple," Democratic Sen. Kamala Harris of California tweeted. Sen. Cory Booker of New Jersey wrote that Trump is "wrong" and transgender service members are "heroes like anyone else risking their lives to defend us." Trump's decision to "not accept or allow" transgender service people comes after Obama essentially invited them to come forward and openly express their gender identity. It also follows a 2016 study commissioned by the Pentagon that found that transgender inclusion would "have minimal impact on readiness and health care costs" for the 1.4 million strong US military. White House Press Secretary Sarah Huckabee Sanders said that Trump made the move to protect "military readiness and unit cohesion," and that the White House would work with the Pentagon to implement the policy "lawfully." But multiple congressional sources told Politico that Trump actually rushed the decision to nail down the last few remaining votes on a $790 billion spending bill that included money for a border wall, one of Trump's first campaign promises. "You cannot allow any of your people to avoid the brutal facts. If they start living in a dream world, it's going to be bad." The "dream world" he mentioned is a reference to a complacent attitude, and it's one that can cost lives if troops aren't vigilant. As a coauthor of the military's counterinsurgency manual (with retired Army Gen. David Petraeus), Mattis has often spoken about following the rules of engagement and being disciplined against a ruthless enemy. "I come in peace. I didn't bring artillery. But I'm pleading with you, with tears in my eyes: If you f*** with me, I'll kill you all." After the initial Iraq invasion, "Chaos" (his radio call sign) sent home his tanks and artillery and used the "carrot and the stick" with Iraqi tribal leaders. "The first time you blow someone away is not an insignificant event. That said, there are some a--holes in the world that just need to be shot. There are hunters and there are victims. By your discipline, you will decide if you are a hunter or a victim." He ended the speech, telling them in Patton-esque fashion, "I feel sorry for every son of a b**** that doesn't get to serve with you." One of his "words to live by" for his Marines in Iraq, which was a call for his troops to remain vigilant and never let their guard down even in the company of those who seem friendly. Mattis demonstrates that he is willing to extend an olive branch to those on the fence — while carrying the weight of Marine firepower if that doesn't work out. He led the 1st Marine Expeditionary Brigade into Afghanistan in 2001 and the 1st Marine Division into Iraq in 2003, and he led an operation into Fallujah in 2004 dubbed "Operation Vigilant Resolve." He also helped to plan the later "Operation Phantom Fury." "A country that armed Stalin to defeat Hitler can certainly work alongside enemies of Al Qaeda to defeat Al Qaeda." Some Mattis quotes don't come without a degree of controversy, including this one. Mattis said this while speaking about his time on the ground in Afghanistan, but he was later counseled by his boss, Marine Commandant Gen. Michael Hagee, who said "he should have chosen his words more carefully." "In this age, I don't care how tactically or operationally brilliant you are, if you cannot create harmony — even vicious harmony — on the battlefield based on trust across service lines, across coalition and national lines, and across civilian/military lines, you need to go home, because your leadership is obsolete. We have got to have officers who can create harmony across all those lines." "Treachery has existed as long as there's been warfare, and there's always been a few people that you couldn't trust." In the letter, he spoke candidly to his troops, telling them "we will move swiftly and aggressively against those who resist, we will treat others with decency, demonstrating chivalry and soldierly compassion for people who have endured a lifetime under Saddam's oppression." When infighting between House GOP representatives threatened to derail the spending bill if it didn't prohibit spending defense funds on treatment for transgender service people, some representatives sought out Trump to take care of the problem via executive action, according to Politico. Trump responded by not only suspending funding, but announcing a complete ban on transgender service. "This is like someone told the White House to light a candle on the table and the [White House] set the whole table on fire," a senior House Republican aide told Politico.